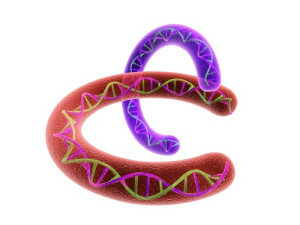 Mechanisms of DNA replication and repair are the basis for the formation of CNVs. CNVs formation is also strictly dependent from the action of some particular genomic regions called low copy repeats (LCRs) or segmental duplications (SDs). LCRs/SDs are tracts of duplicated DNA which are comprised between 1 and 400 Kb in size and of which sequence identity is not below 95%. LCRs/SDs have been crucial in the evolution of primates in respect to other species. Depending on the mechanism in question two types of CNVs are possible: recurrent CNVs and non-recurrent CNVs. Recurrent CNVs arise in regions of high genomic instability in respect to the adjacent regions. Since the breakpoints tend to fall in the same area (breakpoint clustering), recurrent CNVs have always the same (or very similar) extension. CNVs are caused by NAHR events (Non Allelic Homologous Recombination). Non-recurrent CNVs occurring at a certain genomic region tend to have different breakpoints and therefore different size and extension, even if the can share a part of the genomic sequence. Non-recurrent CNVs are NOT caused by NHAR. Both recurrent and non-recurrent CNVs may be pathogenic and cause congenital malformation syndromes or diseases (which are typically severe). At a certain locus non recurrent CNVs are obviously rarer than recurrent CNVs. However, the overall frequency of recurrent CNVs and non-recurrent CNVs across the entire genome is the same. Posted in Academia, Last Update, Medical Genetics and tagged CNVs formation, NAHR.